I watched this TED talk this past week about retrofitting the suburbs . I particularly liked it over other documentaries on suburbia because it wasn’t so nihilistic and the speaker, Ellan Dunham Jones, offered some inventive solutions to make the suburbs more sustainable. I grew up in the suburbs. I understand what life’s like out there: The boring, summer days as an adolescent. The hyper-dependence on vehicles. Getting lost biking around clusters of identical neighbourhoods. Day by day, I heavily consumed resources and bloated my carbon footprint, not knowing any better. Though as times changed, traffic accumulated and gas prices skyrocketed, I was accepted into a university in the city, and it made sense to leave the suburbs. A few months ago, I missed a turn while heading out on a ski trip, and my GPS led me through my old neighbourhood. I almost drove completely right through it before I recognized where I was. After allowing the nostalgia to hit me like five Red Bulls, I pulled over and stepped out to soak it in slower. All the surrounding farms had been replaced by rows upon rows of identical houses. The roads were widened two or threefold. The old mall was leveled long ago in lieu of a big box store shopping center. I couldn’t believe how much had changed. I can’t say if it was for the better, because my old neighbourhood has become a model for urban sprawl these days, but it was a change nonetheless. Unfortunately, as seen in the TED Talk, in parts of North America where the local economies were not strong, many suburban neighbourhoods suffered mass migration over time and eventually became ghost towns. As the talk progressed, it became more interesting as Ellan Dunham Jones illustrated how suburbs, abandoned or not, could be retrofitted to either become more sustainable, usable, or livable. She showed how to positively adapt to change. Here’s how you can too. 1. Simplify. I’m going to move out from my current apartment soon because my neighbours constantly fight, it distracts me, and I’m allergic to drama. Usually, I dislike moving, but this time around, it’s not so bad. I live rather austerely, so there isn’t much to move, and I like my neighbourhood, so I already know where to move to. The way I see it, the more complicated you make your life, the more anchored to where you are, and the more vulnerable you are when things change. 2. Accept Change. Resistance is the bane of adaptation. It’s like travelling to another country and expecting people to understand English if you speak slowly with wild hand gestures. If you’ve lost a job, someone in your life, or just don’t friggin’ know what you want to do with your life, then you can’t challenge the status quo until you accept your current life situation. 3. Expect Change. Understand that change will come, whether you like it or not. People will come and go in your life. The world will evolve. You will get old. Don’t live in fear of it. You don’ t need to stock up a nuclear bunker for whatever fallout might happen, but you do need to be mentally prepared to handle whatever change comes your way. 4. Keep Your Chin Up. In my case, I eventually had to leave the suburbs and go to university in the city. The youthful excitement of being a student in the city outweighed any mild new-to-the-city-I’m-from-the-suburbs inconveniences such as lugging groceries on the streetcar or egads, walking everywhere. And who says change has to bad? Whatever happened to that youthful excitement? As we get older, we tend to become implanted in our lifestyle, and finding excitement amidst change becomes incredibly difficult. In fact, change is a downright fear to most. It’s important then, that no matter what happens, that you seek an opportunity or a learning experience with each change. So get creative with your thinking and really find the golden egg hidden within the bad. 5. Observe How Nature Does It. Nature. Really? I know in light of what I’ve written about suburbia, it seems like we’ve destroyed Nature. But I have a fascination with observing how Nature survives: Spotting a seedling sprouting through a crack in the asphalt. Reading about a 10,000 year old tree in the cold tundra. Learning how superweeds evolve to resist all that we throw at them (Tip: Go Organic). Seeing how Nature has rapidly reclaimed Pripryat, the city closest to the Chernobyl nuclear disaster. As much as we’ve thrown at Nature, it’s still survived. And when humankind has come and gone, Nature will reclaim her space faster than you think. So start with an inner revolution. This is the fire in the belly that will drive you to fulfill your purpose. It can’t just be a quick kerosene fire, a “cool idea” that starts and ends in the span of a lunch conversation. The fire you want has to be hot, smoldering coals, long-burning and difficult to put out, so that when life changes appear in ups and downs, you have the heart to persevere. 7. Ride The Waves Of Change. 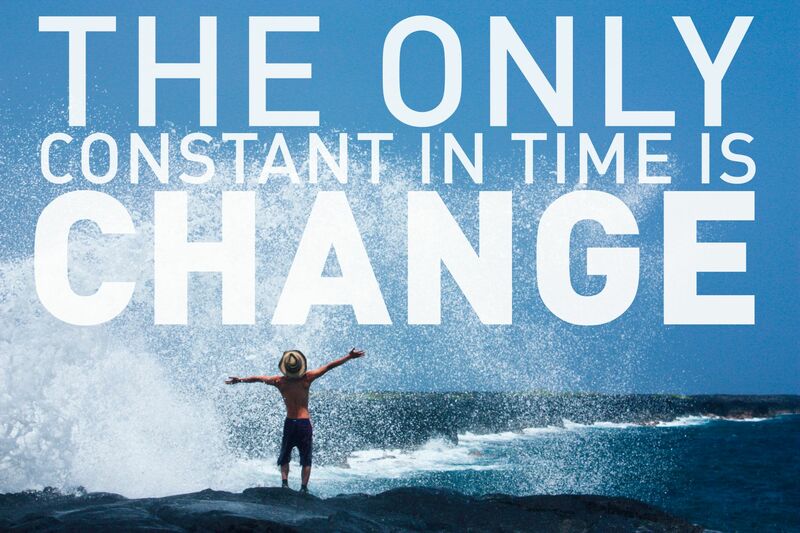 If you’ve checked off all of the above, then it’s time to ride the waves of change. You’ve adapted to the changes thrown at you. You’re a hero to yourself. But then again, who says you have to adapt? What’s the point of always adapting to an unsatisfactory situation or to the will of others? You’re the captain now, so chart your own course. 8. Create Change. You can create the change you want , or like Ghandhi once said, “Be the change you wish to see in the world”. I love, love, love that quote. Want to realize bigger-than-life accomplishments? Again, take that fire-in-the-belly passion from point 5 and convert it into ACTION. Don’t wait for circumstances to become unbearable before you budge. Anticipate and act in advance. Once change becomes the norm for you, you’ve entered a very, very special sanctuary most people never see in their lives. You’re functioning proactively, not reactively. Instead of sitting in traffic complaining about gas costs, you’re designing next generation electric vehicles or public transportation. Instead of bitching about how you lost a document you forgot to save using old-school software, you’ve upgraded to autosaving cloud documents. You become the leader, not the follower. This is how life works. Change constantly comes in cycles of good and bad, success and failure, gain and loss. You can’t have one without the other. Change is integral to life. Resisting change, therefore, is resisting the flow of life, which only leads to self-inflicted drama: feelings of guilt, loss, anxiety, or frustration. If you offer resist resistance, you’ll just find yourself complaining more and more about what is, become more miserable with each passing day, or worse, live in a state of constant fear or depression. So just as some suburbs thrive then deteriorate, you too will experience up and down cycles. We can either allow our lives to become wastelands of abandoned big box stores and deserted parking lots, or we can convert them into functional, thriving living spaces. Change is not necessary to life… it IS life!! Speaking of nature, adapt like a chameleon, like water on a duck- let it just roll off. Worry is useless and wasteful. Thanks so much, Chris. I get ansy if I don’t bring enough change and challenge into my life, a feeling akin to giving up?